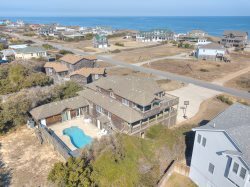 Oceanside - Kill Devil Hills - Check In: Sat. Stress will melt away the moment you feel that salty sea air. This 4-bedroom 4-bathroom oceanside retreat is sure to provide the peace and relaxation you need when you’re on vacation. Located on the beach road, Diggin' It provides amazing ocean views and only 405 feet to the nearest beach access, you’ll have your toes in the sand in just a 2-minute walk. If you prefer to drive, a public access with parking spots and a large bathhouse is right down the road. Diggin' It features a spacious driveway with room for two vehicles beneath the house. Cool off in the private pool on those hot, sunny days or warm up in the bubbly hot tub on those cool breezy nights. Other amenities include an outdoor shower and outdoor grill. Inside, you can hang out in the great room, watch TV, play some foosball, or shoot a game of bumper pool. A full-sized bathroom is located on ground-level. The middle-level is the perfect place to relax after your fun-filled days. Unwind in one of two cozy Queen Master Bedrooms; each are beautifully decorated and feature a ceiling fan, TV, and direct access to a bathroom. Across the hall, the kids will have their own space in a 3rd room with a Bunk bed and a Single bed with TV. If you want some fresh evening air, relish the view on the covered decks on the front and back of the house. Two full-sized bathrooms complete this level. The spacious top-level will be your ultimate coastal escape. The living area features comfortable furnishings, high, vaulted ceilings and plenty of bright, natural light. A large flat-screen TV sits in an alcove above the toasty corner fireplace. The long dining table with ocean views is a great place to enjoy a family dinner or play a round of cards. The vaulted ceilings continue into the modern kitchen, which is stocked with a coffee maker, blender and pots and pans. A large King Bedroom with TV and ceiling fan complete the top-level along with a full-sized bath. Step outside to the screened porch for your morning cup of coffee as the sun rises over the horizon. Large sundecks on both sides of the house mean great views of the ocean to the east and lovely sunsets in the sky to the west. When you’re not relaxing in the house, the town of Kill Devil Hills has wonderful restaurants, historic sites and shopping centers so you’ll have so much to do and explore! Diggin' It sits right across the road from the Stop N Shop convenience store for quick supply runs. For breakfast, try a famous Duck Donuts donut and for dinner, get some fresh seafood nearby at Captain George’s or Rooster’s Southern Kitchen. If you’re in the mood for a night out, Outer Banks Brewing Station has great late-night specials and is just a couple minutes away. If you love fishing, try your luck at Avalon Pier. For family fun, watch the local wildlife along the trails of Nags Head Woods or head over to the Wright Brothers National Memorial to learn why North Carolina is First in Flight. No matter how you choose to spend your vacation, you'll be Diggin' It at this awesome house!